We are delighted to announce the upcoming launch of our new publication ‘What do relationships mean to you?’ Available now! Intimacy, sexual identities, love… what does it all mean? Making sense of our relationships and of the context for these experiences is something that, throughout time, artists from different disciplines and diverse cultures, have recognised the importance of. Sometimes this task requires that we explore our past and present from multiple perspectives. What do relationships mean to you? is the latest emotional learning resource in our series, using visual art to explore sexual identities and intimate relationships. These cards use contemporary art to support reflection on key themes ranging from what makes a relationship meaningful, emotionally enriching and sustainable through to how we articulate sexual difference and alternative sexualities. Needless to say, a good relationship with our inner self is where it all starts! 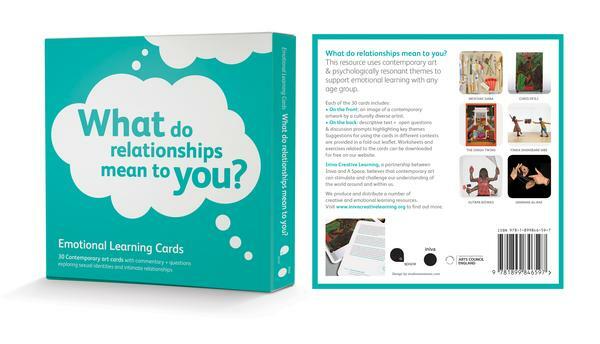 Designed to stimulate discussion, art making, personal reflection, diary writing, storytelling and creative play; the cards can help to make sense of life experiences, open up new ways of thinking about emotions and encourage free expression. – On the front: an image of an artwork by a contemporary artist. – On the back: descriptive text informed by psychoanalytic thinking reflecting on specific relationship themes + open questions to prompt exploration. What do relationships mean to you? is AVAILABLE NOW via the store alongside our other Emotional Learning Cards in this series.